So you have a new Rottweiler in your possession. Whether you’ve purchased your new pooch, adopted it, or it has been given to you as a gift, congratulations. Rottweilers are one of the most robust and powerful dog breeds available. They are also one of the largest. Did you know that at one point in their history, Rottweilers were known as “butcher’s dogs”? This is because they were once used for herding livestock and transporting goods-filled carts to the marketplace to assist their owners. Perhaps this is why one of the reasons why their strong and colossal physique is the way it is today. At present, Rottweilers are bred and kept for several reasons: in some parts of the world they are still used to herd livestock, while in others they are employed to assist with search and rescue efforts. Rottweilers are also trained for usage as guide dogs for the vision impaired, guard dogs, police dogs, and simply as household pets. 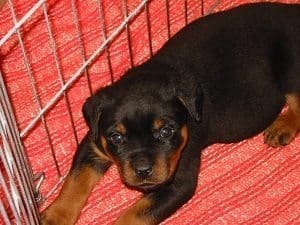 Nevertheless, regardless of what you plan to use your pet Rottweiler for, it is absolutely crucial for its well-being and for your own personal convenience to properly train it to use a crate. Crate Training – Why and How? Before anything else, it is important to realise that the process of crate training will entail a significant amount of patience, perseverance and hard work on your end. Albeit, it is a guarantee that the by-product will be 100 percent worth it for both you and your pooch. Once you are able to successfully train your Rottweiler to use a crate naturally and with ease, you will be taking the first pivotal step towards teaching it good habits that will help to curb problematic behaviour that tends to develop later on in a dog’s life. Additionally, you will also be protecting your home from possible damage that will naturally result from an untrained dog’s antics. It will learn the proper place to use the bathroom. It will become knowledgeable on what items or toys it is allowed to chew, and what items or decor are off limits. It will be kept safe from dangerous items in your home that it otherwise would have certainly pounced on and chewed on. Keep in mind: your Rottweiler is susceptible to all sorts of household dangers if it remains untrained and housebroken. Some of these dangers include chewing electrical wires and getting electrocuted in the process, ingesting poisonous substances, and swallowing foreign objects that could potentially kill it. It will alleviate separation anxiety for your Rottweiler. Contrary to what some dog owners might think, a crate will actually help to calm your pet’s senses, and not make it feel like it is trapped or punished if it is used properly. Using a crate will also help your dog to keep out of trouble and learn how to spend time by itself without growing antsy or behaving badly. 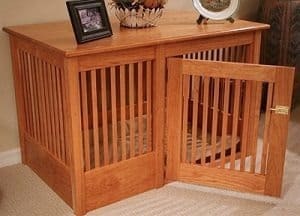 The crate also serves as a convenient avenue for you to keep your Rottweiler in when you are having visitors over and don’t want your pup running around. If you choose one that is lightweight and portable, you can easily transport it from one room to another so that you can keep company with your Rottweiler where you please. You can also use it to bring your Rottweiler to the vet, the groomer’s, or what have you. Now, moving on to the actual crate training process, the first thing that you should understand is that if you go about the process properly, you will find that your Rottweiler actually enjoys spending time in its crate. This is because animals have a natural nesting instinct and if you provide a place that is warm, safe and comfortable, they won’t hesitate or fight the process. There are different sizes of crates for dogs so be sure to choose one that is appropriate for your Rottweiler. There are also open, enclosed and semi-enclosed crates. A Rottweiler would prefer these one that is enclosed or semi-enclosed as opposed to one that is completely open as the aforementioned offers more protection in their eyes. There should be sufficient room for your Rottweiler to snuggle down, stand up, and feel comfortable. Another additional reason why you want to invest in crate training your Rottweiler is because it provides with them with a semblance of a routine, and dogs crave this. It makes them feel secure knowing that they can expect what their day is going to be like. Initially, it may be challenging for you to get your Rottweiler to stay in its crate or even enter it. That being said, what you can do is first put the crate on the floor and leave the door open so your Rottweiler can enter and exit the crate or explore it as it pleases. Be sure to put in bedding, a pillow and a blanket in the crate. Treats are another option as well. Allow your Rottweiler ample time to sniff the crate and investigate it so that it can see for itself that it is completely safe. Be sure to generous with praising and rewarding it once it enters the crate. The second time that this happens, you can shut the door and continue to praise your dog. Repeat this a couple more times with each stay in the crate being longer than the last. 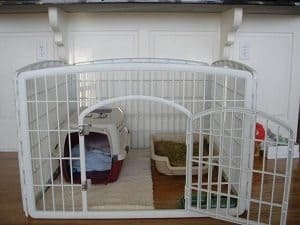 This will allow your Rottweiler to transition seamlessly into being comfortable in staying in its crate. The first time that you leave your Rottweiler in the crate should not go beyond two hours. If you hear it crying or whimpering, as tempting as it may be, do not let it out as it will learn how to use this in order to get out the next time. As soon as the two hours are up, take your Rottweiler to the bathroom and praise it as it does its business. This way, you accomplish a two-fold goal: you’re training your Rottweiler to use the crate, and you teach it how to use the toilet outdoors. Great job. If you are looking for the “right” crate for your dog, look no more – Swell Pets has you covered! Whether you have a small pup or 120-pound beast, at Swell Pets you will find a suitable crate to begin with your crate training routine!